Health and age can become a limiting factor and pose unwanted risks when you travel, which is why it’s ideal to invest in travel insurance. However, for those who need it most, the right level of cover can be hard to come by, making it difficult to travel with complete peace of mind. This is where Just Travel Cover comes in. Specialising in travel insurance policies for the uninsurable, Just Travel Cover provide affordable policies at all cover levels, for all budgets. Get insured quickly and easily for up to 365 days, with their single trip insurance. This cover keeps you protected even if you have pre-existing medical conditions and are over 65. If you travel more than once a year, you also have the option of annual multi-trip insurance that keeps you covered each time you travel and can help you save money in the long run. As well as single and annual policies, Just Travel Cover provides specialist holiday cover for cruises, allowing you to relax on board with the knowledge that your emergency medical treatment is covered, if should you need it. And, with specialist travel insurance for virtually all pre-existing medical conditions, including asthma, arthritis, diabetes, heart conditions, cancer, and even a terminal prognosis, Just Travel Cover ensure you get the right insurance at the best price. Just Travel Cover features a nifty travel blog on their website that can help you to discover more about your chosen holiday destination. Find informative articles on everything from language to food to must do adventures and ensure your getaway is one to remember. And it’s not just fun travel information either. In the blog you can also find important details, you may not have known, about travelling with medical conditions, as well as crucial information about serious conditions that can restrict you from going to certain places. These articles are worth the read and could save you a lot of time, money and disappointment in the future. The Just Travel Cover also includes news, competitions and notices about awards and accolades the company has won. Not only does Just Travel Cover insure those of you with physical medical conditions, but they also place emphasis on mental health conditions, providing cover for people who suffer from Anorexia, anxiety, Bipolar, Bulimia, depression, OCD, paranoia, PTSD, psychosis, Schizophrenia, Tourette’s and much more. Just Travel Cover also know that mental health is a very broad spectrum and therefore cater for specific types of mental illnesses including manic depression and panic attacks, therefore no matter how bad or particular your condition may be, you can travel with the reassurance that you’re protected if something is to happen. Just Travel Cover’s policies can also include other unforeseeable circumstances, such as having to cancel or cut short your trip due to falling ill, loss of travel documents and unplanned legal expenses, as well as cover for winter sports and other hazardous activities. Just Travel Cover aim to help you have a safe travel experience with high quality, affordable specialist travel insurance. With cover available for pre-existing medical conditions at all stages, with no upper age limit, Just Travel Cover cater for those of you who need it most. Take out travel insurance for single trips, annual trips, cruises and pre-existing medical conditions and enjoy a safe journey, holiday and return with the peace of mind that you’re covered. 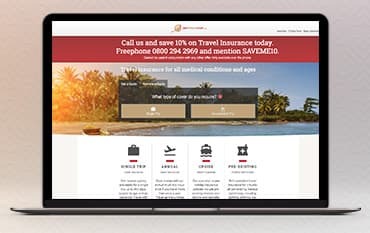 Buy your insurance online with a Just Travel Cover discount code from us and you can enjoy great savings on your policy too.